When I was scouting for aphids in Ville Platte, I was surprized to observe rice water weevil adult scarring on the seedling rice. Rice water weevil feeding scars on a rice leaf blade. Close-up shot of rice water weevil adult feeding scars on rice. This was observed at the LaHaye rww demonstration site in Ville Platte, La (Evangeline Parish). These fields are a perfect location for weevils for a couple of reasons: 1) they are near a lot of bayou areas and 2) the field is bordered by a break of trees – nice overwintering habitat for weevils. It’s not suprising that we are finding rww in these particular fields, but a little surprising to see adults are already moving into fields even in this cool weather. I would encourage you to start scouting for weevil now, particularly in rice that is currently under pin-point flood, or will be flooded soon. 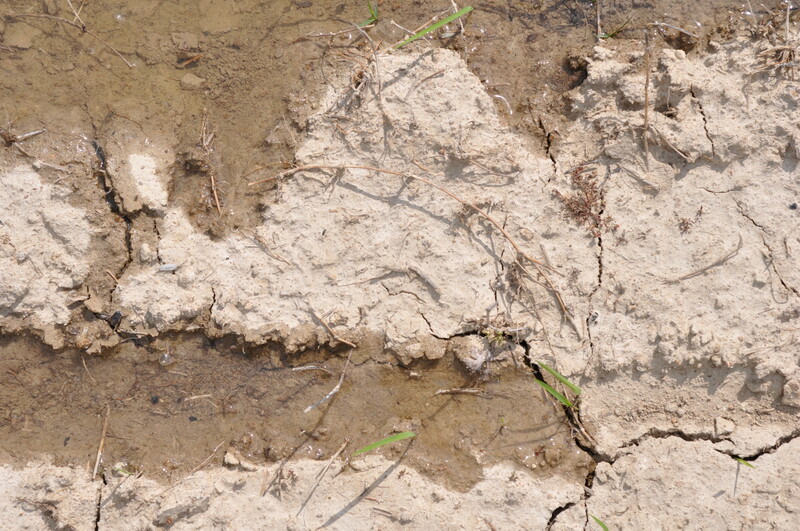 If adults are entering your field, and the rice is flooded, then egg laying can begin to occur early in the season. The application of a pyrethroid early in the season is a judgement call that you will have to make based on your observations scouting. 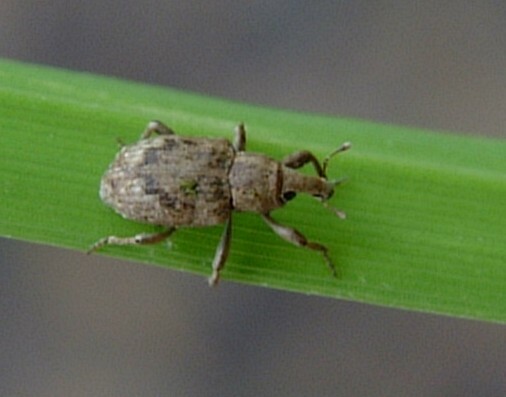 Rice water weevil adult - LSU AgCenter photo. 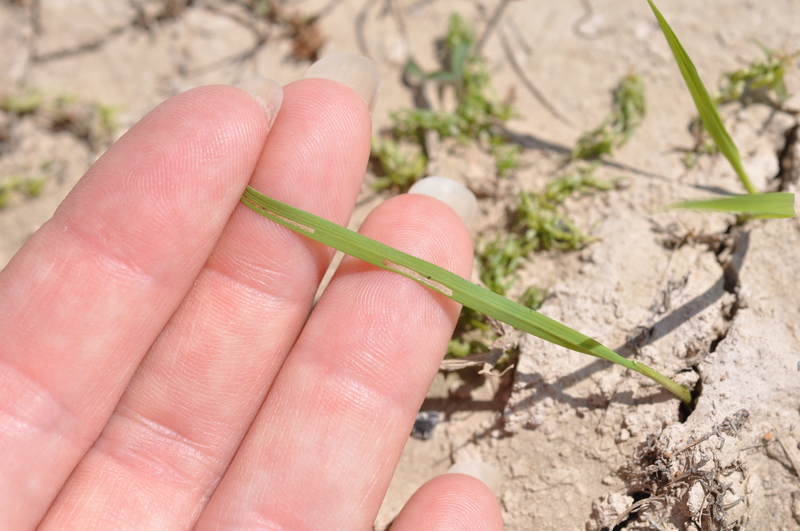 If you planted seed treated with either CruiserMaxx or Dermacor X-100 seed treatment, then you do not need to make an insecticide application for rice water weevil management. 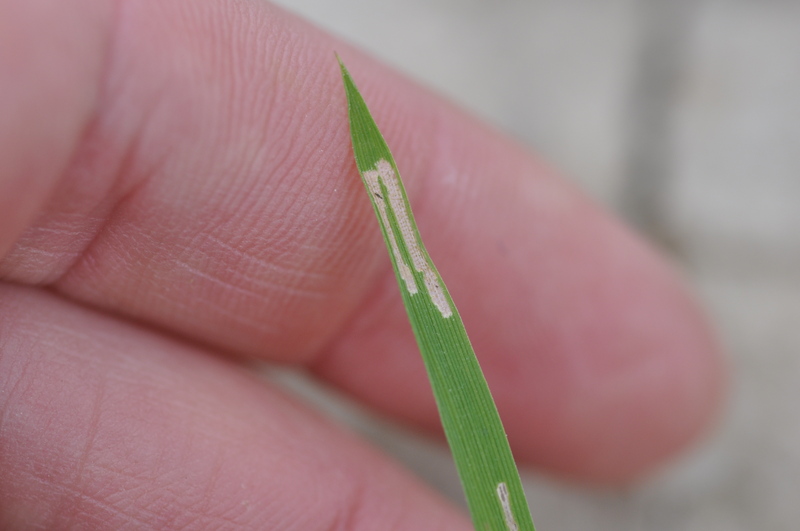 You do, however, need to scout for other early-season pests, such as aphids, chinch bugs, south american rice miner, leafminers and fall armyworm. CruiserMaxx should control the following early-season pests: aphids, chinch bugs, rice water weevil adults and larvae. Dermacor X-100 should control the following early-season pests: south american rice miner, leafminers, fall armyworm, and rice water weevil larvae. For pictures of these early-season pests, please refer to the Louisiana Rice Production Handbook by clicking here. For management recommendations please refer to the Rice Varieties and Management Tips by clicking here. So far, the aphids have not developed into a problem at any of our field test sites. I have spoken with quite a few county agents and consultants about the aphid situation this season. It seems like we have had more than the usual infestation of aphids. It looks like a combination of flushing and biological control (predators and parasitoids) have kept the populations under control. Please contact your local county agent if you see anything that indicates otherwise. I’ll be out in Acadia Parish tomorrow looking at some of our field sites. About two weeks ago the rice was just emerging at the Hoffpauir demo site in Rayne, La. The rice was around first leaf stage, and some aphids were present. Tomorrow, I’ll look closely for any existing aphids when we take stand counts and plant heights. Hope your crop is progressing well. Well the phone started ringing Monday morning with reports of aphids in rice. This really isn’t surprising since we have had such cool weather conditions. I called up Dr. Jeff Davis (LSU AgCenter Soybean Entomologist) to see if he would like some samples for aphid colonies he is establishing. Jeff headed out to the field yesterday and was able to collect samples and (conveniently) identify them to species. It’s really handy to have an aphid expert in the department. Jeff collected aphids in Acadia and Evangeline Parishes. “We saw a lot of parasitism at both locations. 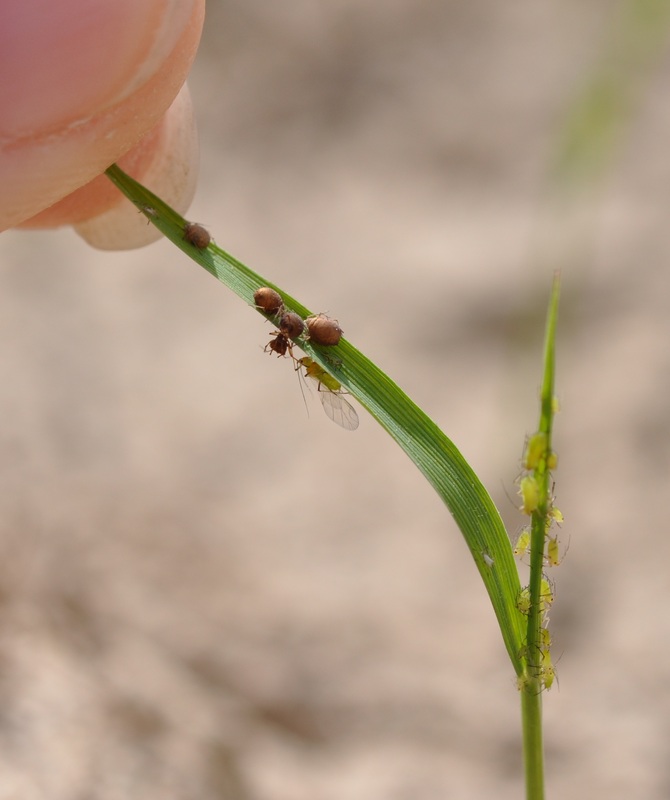 In Ville Platte, there were aphids on the grasses in the field as well as parasitoids. This may indicate that the aphids were on the grasses and when growers applied their herbicide, the aphids moved to the emerging rice. 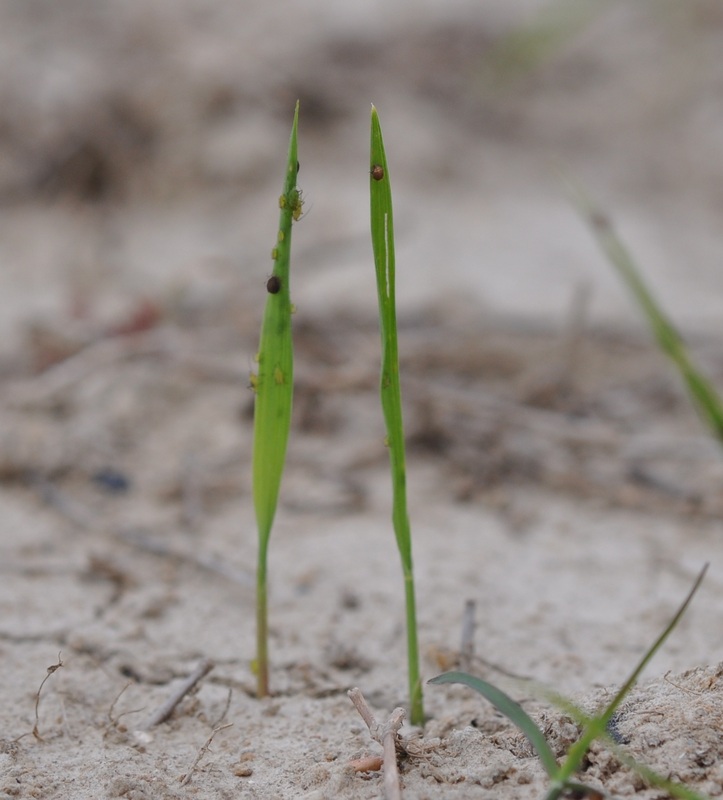 Recommendation: Good weed control early and prior to emergence so aphids do not move to young rice. No aphids [observed] on the Cruiser treated seed. I do not know how long this will last. In soybean, we typically get 30 day control. I was able to get out to the field today to scout some fields and view the situation. The first stop was at the LaHaye rww demonstration site. Kenneth was starting to flush the field. There is a good chance that flushing might take care of the aphid problem. We saw a lot of aphids on the rice, which is at the first leaf stage of growth. Flush moving onto the field. The little specks on the rice seedlings are aphids. You'll need a hand-lens to see the details. Burndown applied immediately before planting. These aphids are feeding on weeds in the field, and when the weeds start to die they move onto newly emerged seedlings. If there was a way to have more time between burndown and planting, that would probably help this situation. I do realize that we are restricted by the weather. Cool weather. 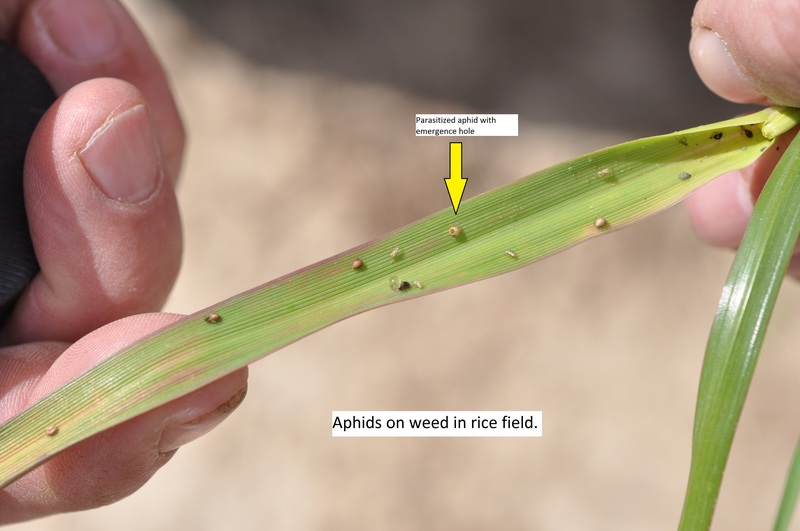 Aphids can establish on seedlings and will likely cause more damage on slow growing rice. We observed a lot of parasitized aphids on weeds that were dying from the herbicide applications. Parasitized aphids on a weed that was dying from exposure to the burn-down herbicide. 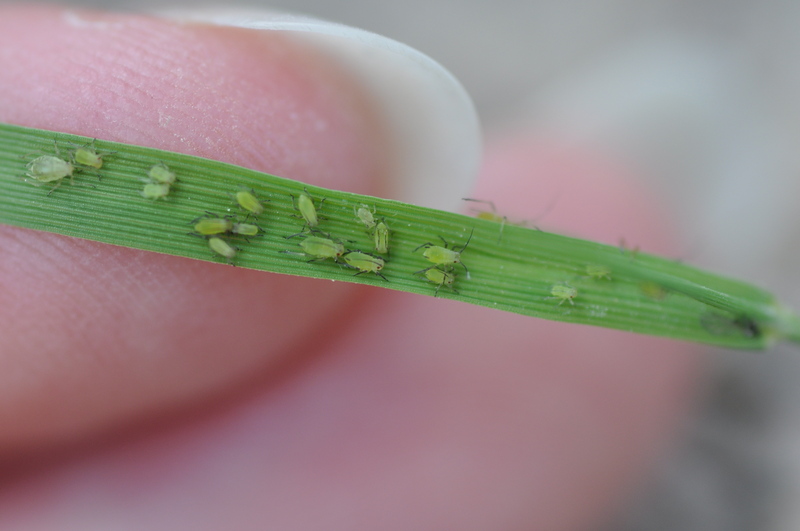 aphids were more abundant in stands of rice that did not have a seed treatment. it appeared that the CruiserMaxx provided protection from the aphids, although this is a natural infestation and we are not looking at a small plot evaluation test, so this observation is not conclusive. 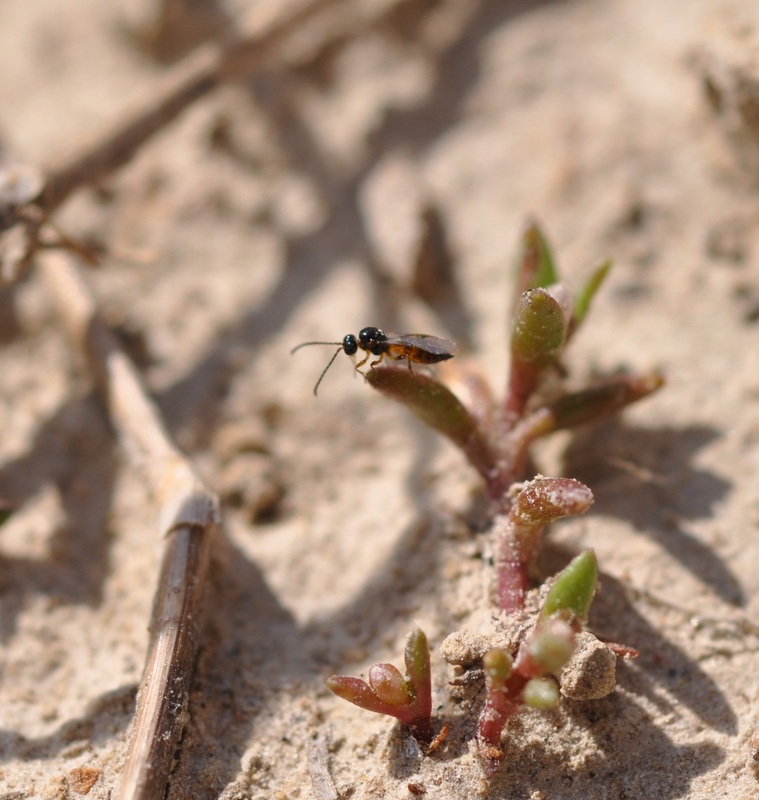 predators and parasitoids were abundant, and may be able to provide control, if given enough time (for pictures, continue reading). plants did not look stressed by the infestation. We do not have standard recommendations or thresholds for treatment of aphids in rice. Proper identification is the first step in deciding the course of action. Some species of aphids produce toxic saliva that can cause stunting or death of small seedling rice. In the past it has been noted that when the fields are flushed, weather warms up, and rice begins to grow, there is no need for treatment. Also, if predators and parasitized aphids are observed in the field, you should continue to monitor the situation and avoid treating unless the plants begin to look stressed. One field in Evangeline was treated with Karate on Monday. I scouted the field today and did not see any insects. Note that any predators were present they were also killed by the pyrethroid spray. If your pyrethroid spray is not adequate, and the aphid population returns, but with no predators in the field, then you could really be in a bind. I recommend waiting a few days to pull the trigger, monitor the health of the rice, and look for predators. If you have questions about treatment, please contact your local county agent. Below are some pictures of what we saw in the LaHaye demo fields. Adult and immature aphids on leaf blade. 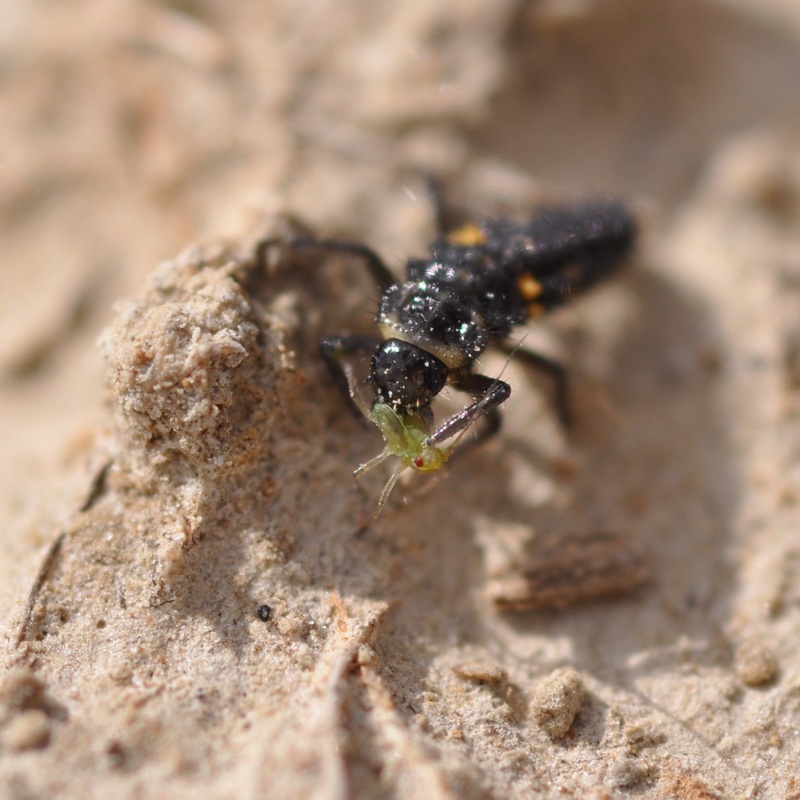 Aphids were walking around on the dry soil looking for plants to feed on. 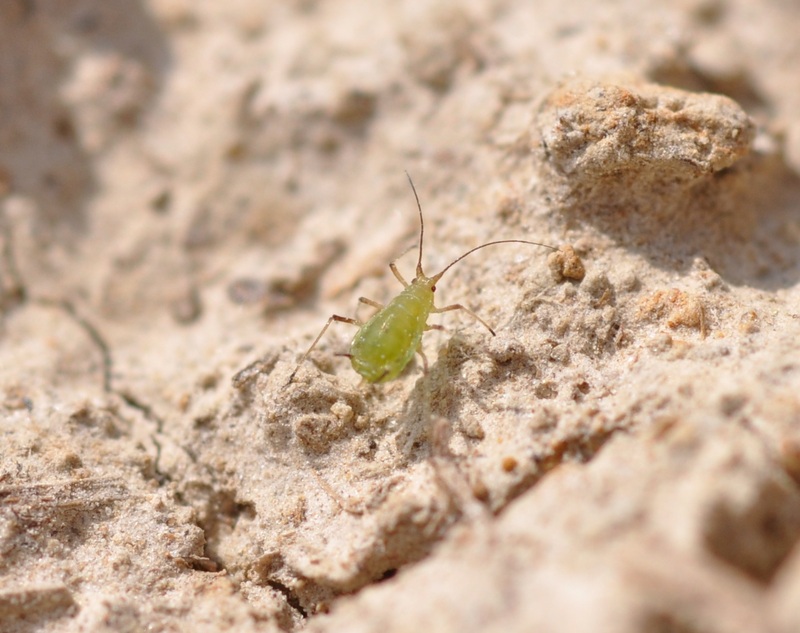 Alate aphids have wings, and apterates are wingless. Fortunately, we also found an abundance of predators and parasitoids that are decreasing the aphid population. 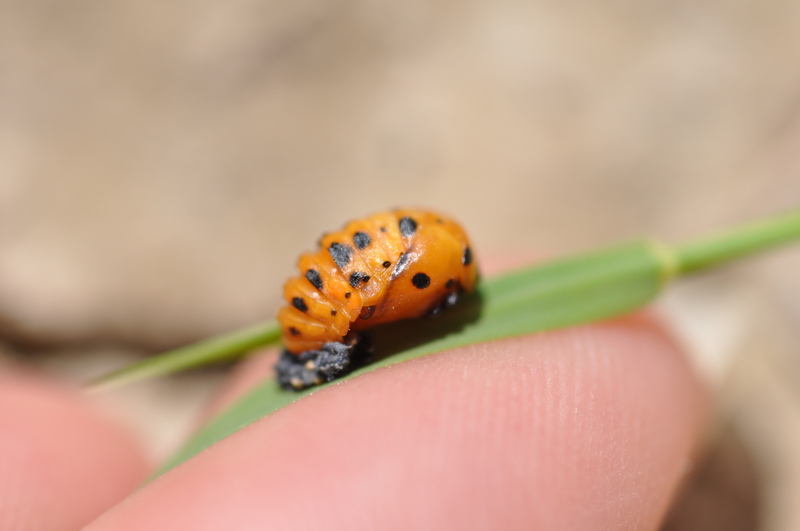 This included ladybug larvae and adults, syrphid fly larvae and also parasitic wasps. A ladybug larva devouring an aphid. Ladybugs will eat aphids both in the larval and adult phases. The pupal stage of the ladybug beetle - this is the phase between the immature and the adult stages. The pupal stage is the resting phase between the larva and the adult. 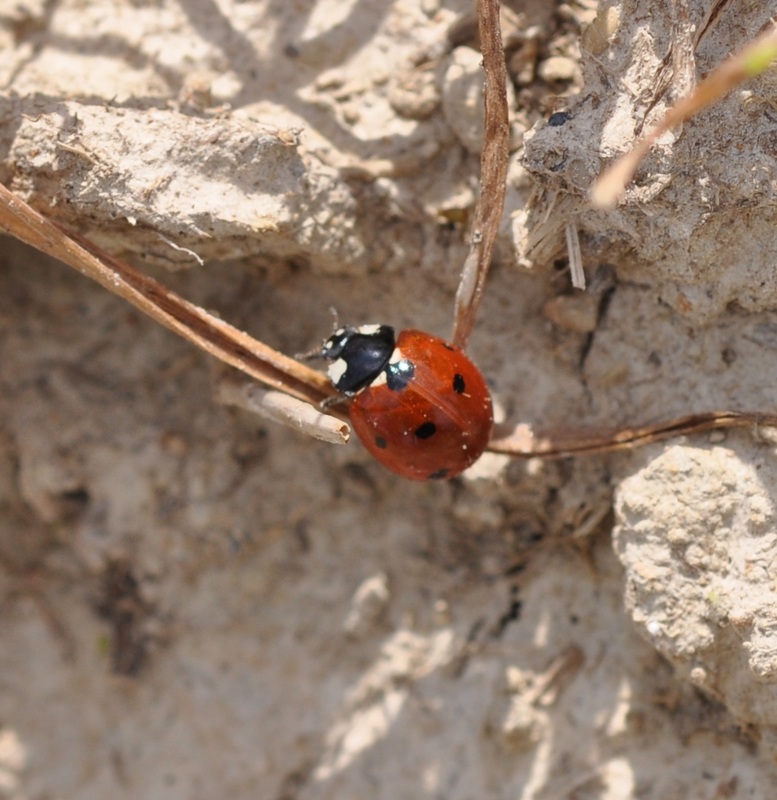 A ladybug adult. Adults will also eat aphids. 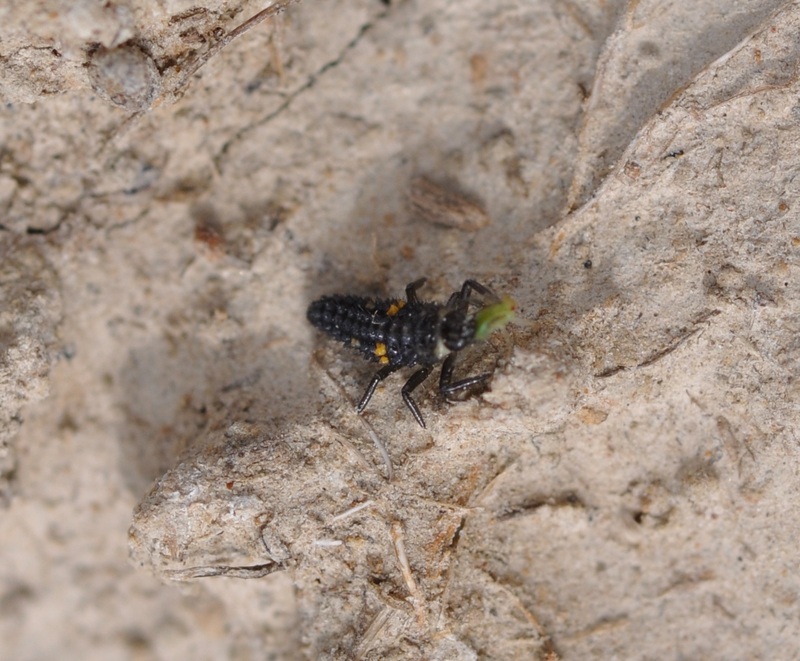 A ladybug larvae eating an aphid. Ladybug larvae are definitely voracious predators. I’m not sure how flushing will affect these predators. We’ll scout toward the end of next week to see what the predator population looks like after a good flush. A parasitoid wasp on a weed in the rice field. Parasitoid wasps control the aphids by producing offspring that devour the aphid from the inside out. The parasitized aphid turns into a mummy, which is round, shiny and often tan, gold or black in color. If the wasp has emerged, you will see a round hole in the mummy. 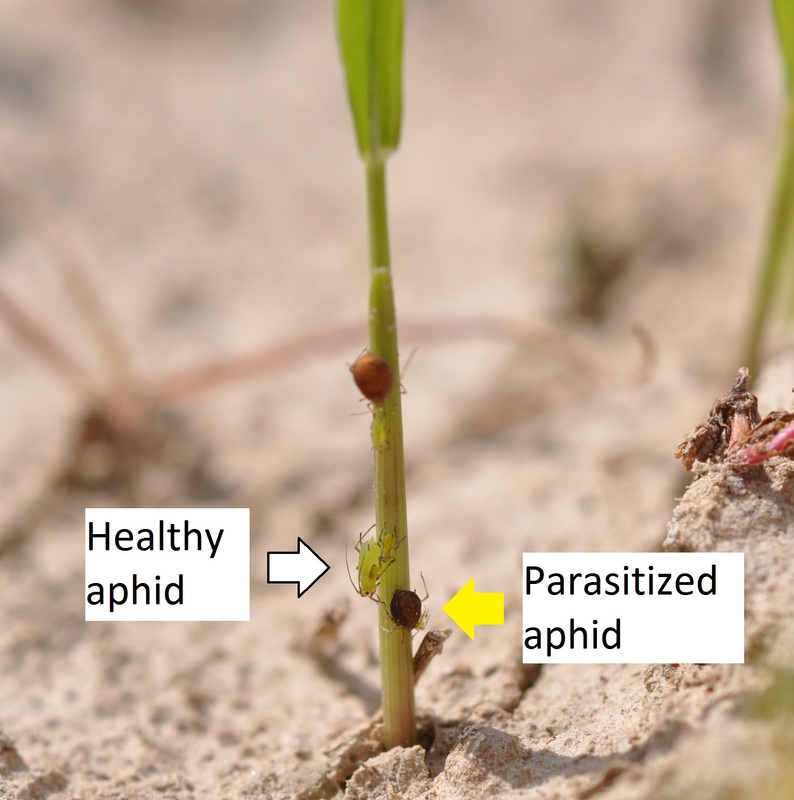 Healthy aphid (green) and parasitized aphid (round and dark color) on a rice seedling stem.